In gaming vernacular the consequences of one's actions are usually marked in body count, or regime changes, or city destruction. So I'm not expecting the consequences that I see unfold in a gunfight in the middle of a future Tokyo: Hurt feelings, obstructionism and... sulking? 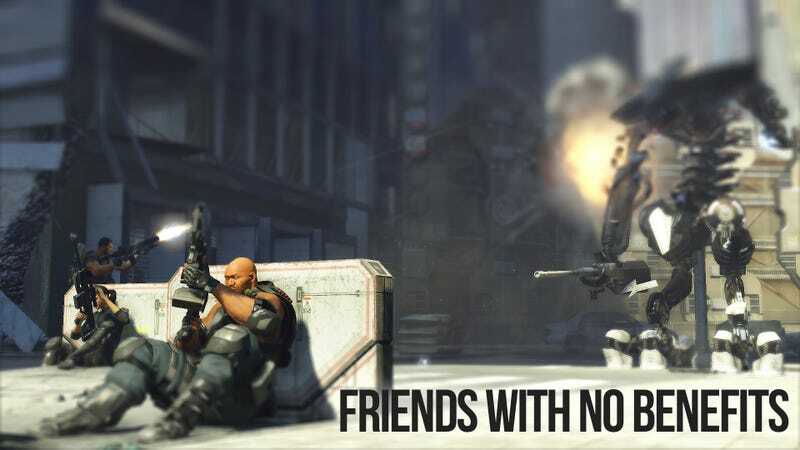 Don't worry, Binary Domain, Sega's upcoming squad-based, third-person shooter, isn't a passive-aggressive behavior simulator. It's not a hipster version of Gears of War, not entirely. But it is a game that will chart the way you treat your console-controlled squadmates and change their willingness to help you based on those actions. What's that mean? Don't compliment someone enough, make bad tactical decisions, force someone into a dangerous position and maybe the next time you call for back-up, your buddies "won't hear you." Need a little healing? "Sorry, we're all busy." While I'd read a bit about the consequence system before, I didn't realize how much impact it could have on the game's battles. Sega's Derrek Peel, brand manager for the game, walked me through a Binary Domain battle twice last week. (The game remains hands off to the press.) The first time, he said, the squadmates had "really low trust levels." "It's always good to have high trust levels but that's not always possible because every character has a different personality." Dan Marshall and his sniper and French robot backups arrive at a Tokyo train station. The robots in the city know the team is here and why, so they attack in waves. Peel, controlling Marshall, asks his team for cover: Both snap to it, providing fire as Marshall moves through the station. He calls for them to regroup on him and both move forward, concentrating their fire on the bots in the distance. It's an effective fighting system that knocks the enemies down and picks them apart in short order. When Marshall asks his team to charge in the thick of things, they don't hesitate. When he asks them to draw fire from a massive robot near the end of the level, they do so without questioning his orders. The team work in unison to clear the level fairly quickly. But then Peel takes me back to the beginning of the station and loads up a version of the level where his team has lost their faith in him. He starts off with something simple, asking the team to stick by his side as they march through the station. Not happening, both AI-controlled teammates refuse the order and walk off without him, wandering forward or lingering back. When Marshall is pinned down by sniper fire, something he never ran into in the first play-through because his sniper just took the bot out on her own, his teammates refuse to help out. "Cover me," Marshall bellows with a button push. It's also obvious that the two other characters aren't being very effective, instead of concentrating their fire on the advancing robots, they're sorta wandering around, hiding, or just not shooting the most imminent threat. They also seem to be less accurate. At some point Marshall is knocked down. Health dangerously low, on his back, he calls for help. No one responds. Eventually, after managing to heal himself. Peel searches the area for his wayward teammates. They've somehow managed to cross the tracks of the station and get hung up fighting a single bot. Apparently, they were too busy to come to his rescue. There's a clever edge of passive aggression I pick up on in the game play, but there's also a bit of quirkiness to the system that bothers me. For instance, gaining and losing trust doesn't seem to be done in effective or obvious ways. While that may make the "consequence system" more realistic, it doesn't make for a wonderful play mechanic. For instance, there doesn't seem to be any quick or even sort quick way to dig yourself out of the hole you create by mistreating your squadmates. I can see that leading to some nearly game breaking problems, with a player scrambling to take on sections of the game essentially alone because of some bad decisions earlier on in the game. It also wasn't clear when your actions had a direct impact. I was told that the life signal, which appears on the screen as you play, will change colors and display an arrow when you do or say something that impacts trust. But even looking for it when I was just watching I wasn't able to spot the signal something had happened. There's a lot of potential here, beyond even what I saw. I was told that if the trust is high enough you'll even get tips on how to defeat those big bots, essentially the bosses of the game. That's a great idea, it's just an idea that needs some polish. I'm just not convinced the game will have enough time to tweak this interesting mechanic before it hits consoles on April 28.